West Africa as known to the ancients Voyages of the Phoenicians The Periplus of Hanno Extent of his voyage Expeditions of Eudoxus of Cyzicus Traces of Phoenicians on the Gold Coast. IT is a well-authenticated historical fact that frequent voyages were made from the Mediterranean along the Western Coast of Africa, both by the Phoenicians and the Egyptians, many hundred years before the Christian era ; but considerable difference of opinion as to the extent of these voyages prevails, and it is not generally held that they were pushed far south as the Gold Coast. There seems, however, fair ground for supposing that that part of Western Africa was not entirely unknown to the ancients, though it must be confessed the whole subject is involved in great obscurity. S T one of the writings of the Phoenicians, the greatest maritime people of antiquity, have been transmitted to us ; but the numerous colonies which they established on the shores of the Mediterranean, and the Atlantic beyond the Straits of Gibraltar, attest the extent of their early voyages. Some of these colonies were founded between 1200 and 800 B.C. The Harmattan is a dry and dusty West African trade wind. It blows south from the Sahara into the Gulf of Guinea between the end of November and the middle of March (winter). The temperatures can be as low as 3 degrees Celsius. The name comes from or is related to an Akan cognate. In Ghana ery often with more intensenty in the last four days of February and the first three days of March. On its passage over the desert it picks up fine dust particles (between 0.5 and 10 micrometres). In some countries in West Africa, the heavy amount of dust in the air can severely limit visibility and block the sun for several days, comparable to a heavy fog.It can even break the trunk of the pine trees, growing in that region, through their dryness. The effect caused by the dust and sand stirred by these winds is known as the Harmattan haze, which costs airlines millions of dollars in cancelled and diverted flights each year, and risks public health by increasing meningitis cases. Esp. in Northern Ghana and Burkina Faso. Most of the year dry lands. The best time to visit Ghana is during the dry months from November to April. Ghana is hot and humid year round, but slightly less so during these months. The dry season also means less mosquitoes and some of the secondary roads will also be in better shape. The drawback of the dry season is that the "harmattan" kicks in, especially in the north of Ghana. The harmattan is a hot wind that carries Saharan sand, making it dusty and therefore not ideal for photographers looking for clear shots. The rainy seasons in the center and southern regions usually last from April - June and September - November. The drier northern region experiences its rains from March - September. More about -- Ghana's climate and average temperatures. Mole National Park in the north of the country. The best time to visit is during the dry season from January to March. Roads are in better condition and the animals are not so widely dispersed, but rather concentrated around permanent water holes. This makes it much easier to spot them. Kakum National Park - all year round, near Cape Coast. All forts and castles are built on the coast (only Kumasi Fort is located in Kumasi, Ashanti region of Ghana). Best time for a visit is all year round. Ghana is hot and relatively humid year round with average temperatures hovering around 27 - 30 Celsius Accra on Ghana's southern coast and up to 32 - 43 Celsius in Northern Ghana. (Tamale & Bolgatanga) (day time). If you can afford a hotel with ac and/or a pool it's worth it. 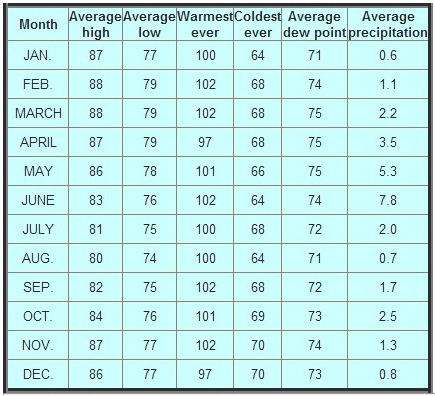 The coolest time of year is between June and September when the main rainfall occurs. Variations in temperature both annually and daily are quite small. The minimum teperature is around 23C (73F). warm and comparatively dry along southeast coast; hot and humid in southwest; hot and dry in north. In 1960 roughly 100 linguistic and cultural groups were recorded in Ghana. Although later censuses placed less emphasis on the ethnic and cultural composition of the population, differences of course existed and had not disappeared by the mid-1990s. The major ethnic groups in Ghana include the Akan, Ewe, Mole-Dagbane, Guan, and Ga-Adangbe. The Ashanti tribe of the Akan ethnic group are the largest tribe in Ghana and one of the few matrilineal societies in West Africa. Once renown for the splendour and wealth of their rulers, they are most famous today for their craft work, particularly their hand-carved stools and fertility dolls and their colourful kente cloth. Kente cloth is woven in bright, narrow strips with complex patterns; it’s usually made from cotton and is always woven outdoors, exclusively by men. The village is a social as well as an economic unit. Everyone participates in the major ceremonies, the most frequent of which are funeral celebrations which typically last several days. Attendance at funerals is normally expected from everyone in the village and expenditure on funerals is a substantial part of the household budget. The Ashanti are noted for their expertise in a variety of specialized crafts. These include weaving, wood carving, ceramics, and metallurgy. Of these crafts, only pottery-making is primarily a female activity; the others are restricted to male specialists. Even in the case of pottery-making, only men are allowed to fashion pots or pipes representing anthropomorphic or zoomorphic figures. They are living mainly within the Ashanti region, but also on costal Ghana. Spoken language is TWI. The Ashanti kingdom was heavy involved in the slave trade, as they invaded often parts of [now] Northern Ghana, and captured people of other tribes, which where then sold to the European traders directly or to the Fanti and Ga tribes. They again sold or exchanged the northeners then to the European slave traders. The Ewe are a people located on the southeast corner of Ghana, east of the Volta River, in an area now described as the Volta Region. The Ewe are a people of southeastern Ghana, Togo and Benin. They speak the Ewe language, and are related to other speakers of Gbe languages such as the Fon and the Aja of Togo and Benin. The Ewe have developed a complex culture around drumming. Ewe believe that if someone is a good drummer, it is because they inherited a spirit of an ancestor who was a good drummer. Music and dance are a force in cementing social feeling among members of an Agbekor society. The Ewes make up about 11% of the Ghaian population. Also, the Ewe are well know, as the Ashante people, to make good Kente. The cloth is woven in bright, narrow strips with complex patterns; it’s usually made from cotton and is always woven outdoors, exclusively by men. The now Volta region was once [till officialy 1921], part of German Togoland, and was then divided into French an British Togoland. The Fantes, part of the Akan ethnic group are mainly located in the south western coastal areas (Cape Coast) of Ghana. The Fantes are the second largest members of the Akan ethnic group with a population of about 3.100,000. Ga people are also known, to have invented the "Fantasy Coffins" of Ghana. The Guan are believed to have begun to migrate from the Mossi region of modern Burkina around A.D. 1000. Moving gradually through the Volta valley in a southerly direction, they created settlements along the Black Volta, throughout the Afram Plains, in the Volta Gorge, and in the Akwapim Hills before moving farther south onto the coastal plains. Some scholars postulate that the wide distribution of the Guan suggests that they were the Neolithic population of the region. Later migrations by other groups such as the Akan, Ewe, and Ga-Adangbe into Guan-settled areas would then have led to the development of Guan-speaking enclaves along the Volta and within the coastal plains. The subdivisions of each group share a common cultural heritage, history, language, and origin. These shared attributes were among the variables that contributed to state formation in the precolonial period. Competition to acquire land for cultivation, to control trade routes, or to form alliances for protection also promoted group solidarity and state formation. The creation of the union that became the Asante confederacy in the late seventeenth century is a good example of such processes at work in Ghana's past.